I drank at mile 2, 4, and 6, and GUed at mile 4. I am very happy with this run. My calf was sore at the end and loosened up after I stretched after I got home. Course: Past Cattail and back. Comments: Started off with the slower group, but pulled away from them at mile 3. My fastes mile was mile 8!!! I ran around Antrim Park thinking about running the 10 miler race there next weekend. I am still on the fence about that being that it doesn’t start until 9am. I’ll make that decision later on in the week, depending on the weather forecast. Went quadding on Sunday. My legs were not sore at all from the 8 miler and the pushups I have been doing really helped with the handling of the quad. 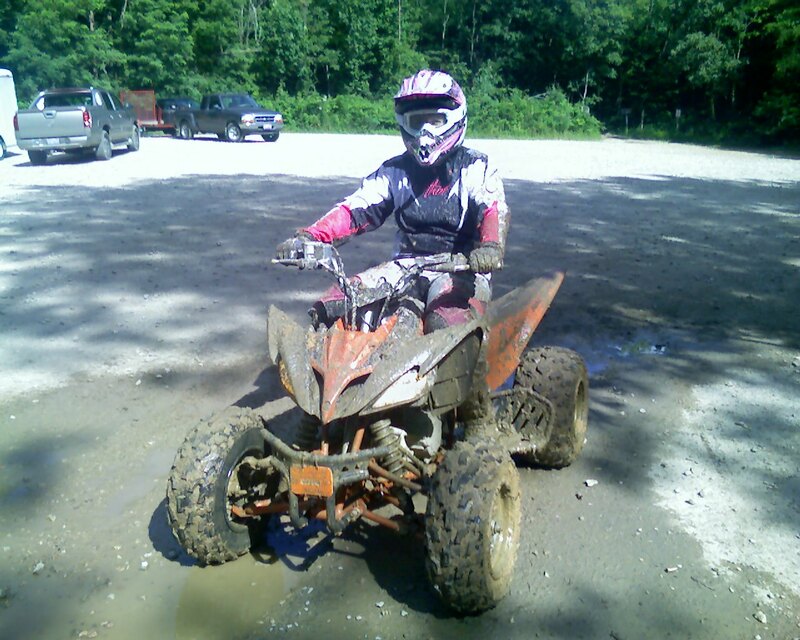 Hence I had a blast in the mud. Comments: Group Run. I decided to run with the group, but either way in the front or all the way in the back so I don’t feel like I need to follow the running rhythm of the person in front of me. The group leader decided to go a sightly different route, through some neighbourhoods and then to the park/bike path. It made for an interesting run. Instead of following them back into the neighbourhood on the return, I decided to stay on the trail. I was worried that if I was to ‘die’ at the end I might loose them and be lost in the neighbourhood forever! The weather was much nicer, overcast, than last week and my overall pace was 22 seconds per mile faster than during the 10k. I have been toying with the idea to run the Detroit Marathon in October (a few friends of mine are running it), even gone so far as to reserve the hotel room, but now I feel like I really want to run the Columbus Marathon again. Good thing I still have a few months to make up my mind.